V Resorts Pauri was earlier known as Mumukshu Resort. 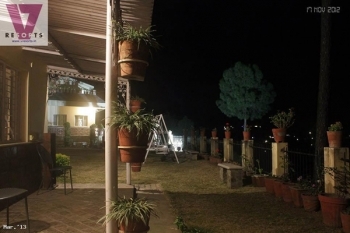 It is one of the finest and deluxe hotel in Pauri is well facilitated and provides many categories of accommodation as well as entertainment options so that your stay here is relaxing and enjoyable. The view from V Resorts Pauri offers several snow capped peaks of mighty Himalayas including Trishul, Gangotri group, Nada Devi, Hathi Parvat, Swarga Rohini and Neelkanth. In clear weather (from September to May), these peaks are seen from each and every room of the hotel. 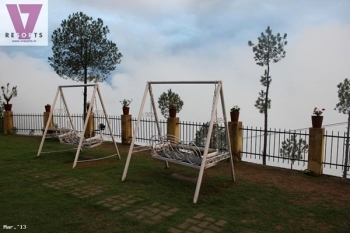 V Resorts Pauri is all about the views, with the cool air complement the view to make it a complete whole. V Resorts Pauri is located in Pauri Garhwal on Dev Prayag road. Pauri Garhwal lies on the Rishikesh - Badrinath Route and an adventure getaway ex-Delhi (340 kms). The resort can be reached in just 15 minutes drive from Pauri. V Resorts in Pauri has 15 rooms which are spacious double rooms with attached bath room having 24 hours running hot and cold water. All rooms have room service. The food at the resort, whether had in the vast open lawns with view of the peaks or taken in the room, is sure to tickle your taste buds to ask for more. - Some activities are seasonal and will be charged extra. - For Groups (GIT) Travellers, i.e. 4 or more rooms booking. Pauri V Resort is 305 Kms from Delhi and be reached in 7-8 hours from New Delhi. Delhi via Meerut, Bijnor, Nazibabad, Kotdwara to Pauri. Another motorable road route is via Meerut, Muzaffarnagar, Roorkee, Haridwar, Rishikesh, Devprayag to Pauri (340 Kms).